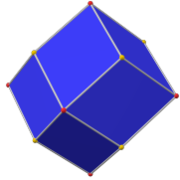 In geometry, a triakis octahedron (or trigonal trisoctahedron or kisoctahedron) is an Archimedean dual solid, or a Catalan solid. Its dual is the truncated cube. polyhedron constructed by octahedron with triangular pyramids added to each face. It can be seen as an octahedron with triangular pyramids added to each face; that is, it is the Kleetope of the octahedron. 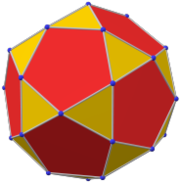 It is also sometimes called a trisoctahedron, or, more fully, trigonal trisoctahedron. Both names reflect the fact that it has three triangular faces for every face of an octahedron. 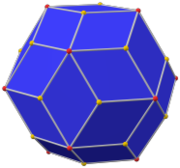 The tetragonal trisoctahedron is another name for the deltoidal icositetrahedron, a different polyhedron with three quadrilateral faces for every face of an octahedron. This convex polyhedron is topologically similar to the concave stellated octahedron. They have the same face connectivity, but the vertices are in different relative distances from the center. A triakis octahedron is a vital element in the plot of cult author Hugh Cook's novel The Wishstone and the Wonderworkers. 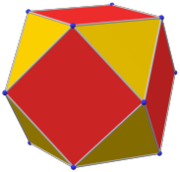 The triakis octahedron is one of a family of duals to the uniform polyhedra related to the cube and regular octahedron. The triakis octahedron is a part of a sequence of polyhedra and tilings, extending into the hyperbolic plane. These face-transitive figures have (*n32) reflectional symmetry. The triakis octahedron is also a part of a sequence of polyhedra and tilings, extending into the hyperbolic plane. These face-transitive figures have (*n42) reflectional symmetry. ^ "Clipart tagged: 'forms'". etc.usf.edu. Eric W. Weisstein, Triakis octahedron (Catalan solid) at MathWorld. This page was last edited on 31 August 2018, at 16:46 (UTC).